This page allows for viewing and managing of all user profiles from central location. You can search and filter, activate/deactivate, delete, and move (from one group to another) users. Users are presented in a tabular view. Each row contains a checkbox on the left end for batch operations selection. On the right end, there is a “View” link; click on it to view profile of the user. NEW USER: It will direct control to user creation page, where various user related attributes can be specified. ACTIVATE: It will activate all the selected users. Activated profiles will be able to access all the granted privileges. DEACTIVATE: It will deactivate all the selected users. Useful for batch operations. 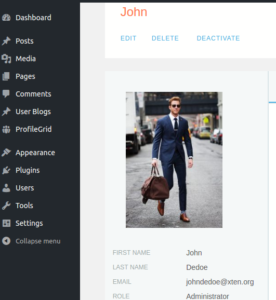 DELETE: It will delete the selected users from WordPress. Please note that this action is irreversible. In Multi site environments, this will only remove the user from current website instead of deleting it. You can display profile of a user by clicking on “View” in the table view. On user profile page, basic details are shown about the user on the left side along with the profile image. From the operations tab, further functionality related to editing, deleting, activating/deactivating user is available.